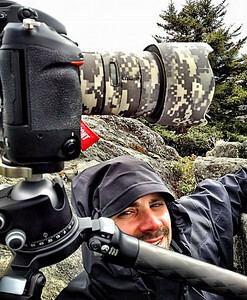 Eric Esterle is a freelance photographer (Eric Esterle Photography LLC) and two time award-winning photographer for the U.S. Federal Government. He has photographed many U.S. public figures in the studio and on location. His public-domain photographs have appeared in publications such as The White House Presidential Transition Booklet, The New York Times, and various Federal Government publications and online mediums. Eric licenses a selection of his private work for certain commercial clients. His private work has been licensed to Popular Photography Magazine, Conde' Nast Travel, and have graced the Nikon USA website. Mr. Esterle's work has been published in articles for Alaska Magazine, Wild Planet Photo Magazine, U.K. Based N Photo Magazine, 500px, Topaz Labs, The Baltimore Sun, The Philadelphia Inquirer, Caters News, The Weather Channel, and The New York Post to list a few. Eric is a contributing photographer to the Aviation Photo Journal, but his passion is wildlife and conservation photography. His wildlife photos have won numerous National Geographic Daily Dozen, Top Shot, and Editor's Favorites awards. His wildlife image also won the 2016 Chesapeake Bay Foundation's Viewer's Choice Award and have been published in N-Photo Magazine on several occasions. In addition a selection of Eric's photos were licensed for use in book and calendar prints by Capture Maryland Outdoors, the Chesapeake Bay Foundation, and shared on Twitter to over a half-million users. Eric is a PADI certified diver and enjoys spending his time outdoors. When on land, Eric enjoys photographing wildlife, landscapes, city-scapes, aviation, sports, and loves to travel, recently completing an expedition to Antarctica reaching all 7 continents. Eric is an active member of the (application-based) Nikon Professional Services (NPS) cadre and has previously worked for the Walt Disney Company as a photographer. While much of Eric's experience is self-taught he has complimented life-long learning with classroom instruction in flash photography and studio lighting at the Washington School of Photography. Through Eric Esterle Photography LLC, Eric provides consultation and workshop instruction to small groups of photographers whom are seeking to expand their photography skill-set. Additionally, Eric works with Art Directors and creative designers on specific creative projects. For more information on these services please contact Eric at iam@ericesterle.com.